But one thing a novel, even one by Mitchell, has great difficulty doing without is some kind of narrative arc, ideally tied to a character or group of characters. quite simply, a novel needs a central figure who changes or struggles, whose journey we, as readers, can relate to. The very best experimental fiction may have something to offer that replaces such a basic premise. Unfortunately, Mitchell’s latest, “Slade House,” is not such a book, and its utter derailment after a wonderfully spooky first half is a disappointment. “Slade House” begins with great promise. It’s 1979, and an impoverished single pianist is dragging her young misfit son Nathan to a posh London address, where she has been invited to perform. Written from the boy’s point of view, the introduction shows us his fears and his desires to be accepted in typically witty, precise Mitchell fashion. Nathan is an observant little boy, presciently wondering how such a large house and garden can fit into the tiny alley he and his mother have entered. But he seems incapable of figurative thought, as when he reminds his mother of why he’s no longer in the scouts (the scoutmaster told him to “get lost,” and he did), evoking at times the autistic narrator of Naoki Higashida’s “The Reason I Jump,” which Mitchell, who has an autistic son, translated. As his mother plays Tchaikovsky, Nathan is lured away by an apparently kind boy. Only his companion is not who he seems, and as the day grows increasingly odd, Nathan’s exceedingly straightforward descriptions add to the growing horror, until he meets a fate worse than death. Nine years later, it’s a divorced policeman who is heading toward Slade House. Observant readers will note some strange similarities as Detective Inspector Gordon Edmonds approaches: a jogger in a garish outfit, an ambulance, the presence or absence of a cat (a Schrödinger joke, perhaps?). Although the inhabitants appear different from those who lived there earlier, Edmonds meets the same fate. When, nine years later still, a chubby, lonely college student stumbles into a party at Slade House, we know what will happen. Or do we? Despite the horrific fate met by visitors, some seem capable of leaving clues behind. “You may find a weapon in the cracks,” a disembodied voice advises. “For you, it’s too late . . . But pass it on.” The recurring motifs begin to add up, until finally one potential victim is almost rescued. And then Mitchell drops the ball. Readers of his previous work “The Bone Clocks” will recognize the name of the next visitor to Slade House, Dr. Iris Marinus-Fenby. The psychiatrist is one of the Horologists, eternal souls fated to be reincarnated as protective beings. These readers will anticipate what happens next. Others, not so lucky, will be taken aback as one more assault is simply flouted. The paranormal abduction appears to be unfolding as usual, when suddenly Marinus, as she’s known, refuses. “Why in the eleven thousand and eleven names of God would I oblige two parasitic soul-slayers by imbibing their poison?,” she asks. From then on, its all “pyroblasts” and “glyphs,” and the battle is easily won. Mere mortals are safe from future attacks, but those who came before may as well be forgotten. Their long struggle to learn and to help each successive victim barely registers as a factor, shelved with all the clues the reader has accrued. And although a cliffhanger ending holds out hope for a more satisfying conclusion, it will not come until at least the next book. 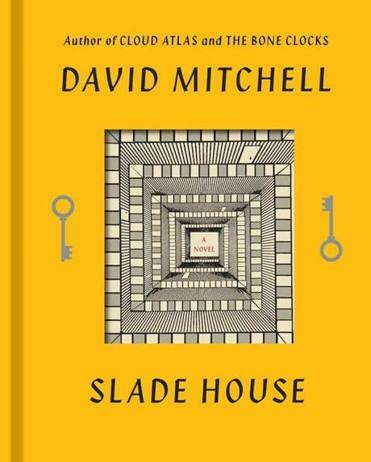 “Slade House” is less a novel than a chapter in Mitchell’s ongoing saga about the battle between the Horologists and the evil Atemporals, as the inhabitants of Slade House are revealed to be. But by ignoring his mortal characters, he risks losing his flesh-and-blood audience and possibly his own soul. Clea Simon is the author of 19 novels. She can be reached at cleas@earthlink.net.